Home / Phcog J, Vol 8, Issue 2, Mar-Apr, 2016 / Finger Printing of the Anatomical Markers, HPTLC Profile and Heavy Metals Content in the Leaves of Aristolochia indica Linn. Finger Printing of the Anatomical Markers, HPTLC Profile and Heavy Metals Content in the Leaves of Aristolochia indica Linn. UGC-Academic Staff College, University of Calicut, Calicut University PO, Malappuram District, Kerala, INDIA. Background: Aristolochia indica Linn is now an endangered medicinal plant belonging to the family Aristolochiaceae. Many ethono-botanically important species of Aristolochia were found used in the traditional forms of medicine for the treatment of various illnesses. Aim: The present study concerns the microscopic, fluorescent, powder, quantitative microscopic characteristics of the leaves of Aristolichia indica Linn and its physico-chemical standards. 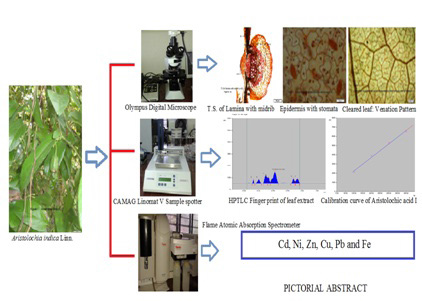 Materials and Methods: Morpho-histological profile, Highperformance thin-layer chromatographic (HPTLC) finger print profile, and heavy metals content of the leaves of Aristolichia indica Linn. Results: The presence of camptodromous pinnate venation with pentagonal shaped areoles with linear veinlet endings, non-glandular hooked trichomes, amphistomatic and anomocytic stomata, small palisade ratio, small stomatal index were the anatomical features characteristics of the taxon. Physico-chemical evaluation of the leaves gave moisture content of 10.5%, total ash 12.7%, acid insoluble ash 1.9%, acid soluble ash 10.8%. Highperformance thin-layer chromatographic (HPTLC) identification of marker compound (Aristolochic acid I or (AAI)) in methanol extract of leaves was carried out. The developed HPTLC Chromatogram had revealed nine phytoconstutents in extract of leaf sample. The Rf value for Aristolochic acid I (C17H11NO7) was found to be 0.41 and densitometric scanning had shown λmax at 318 nm for the marker compound. The content of marker constituent (AA I) present in shade-dried leaves of Aristochia indica Linn was estimated as 0.049%. The Flame atomic absorption spectrometric determination of elements had shown appreciable amounts of the elements such as Fe (0.5442 mg/g), Zn (0.026.82 mg/g), Ni (0.008 mg/g,) and Cu (0.002 mg/g) by dry weight of the leaves of Aristolichia indica. Conclusion: The present study suggests that the delineated characteristics of the leaves of A. indica, could tag as the identifying parameters to substantiate and authenticate the raw drugs from the spurious/adulterants materials and could also be effectively used for the regulatory perspectives and quality assessment of Aristololic acid Ι in the medicinal formulation/finished products. The presence of important mineral elements inside this plant showed that it could be a nutritious plant and important to the human health. ‹ Comparative Study of Antioxidant Activity of Ethanol and Aqueous Extracts of Different Parts of Nyctanthes Arbor-tristis Linn. Sudhakaran MV. Finger Printing of the Anatomical Markers, HPTLC Profile and Heavy Metals Content in the Leaves of Aristolochia indica Linn. Pharmacognosy Journal. 2016;8(2):117-126.